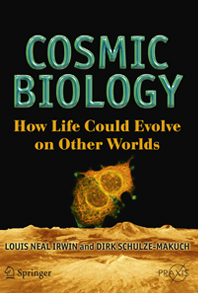 As the title suggests, this book explores the possibilities of life on other worlds but importantly it also delves deeper into the chemical restraints or possibilities for types of organisms that have not evolved here on Earth. It is clearly written and explains chemical processes in an easy to understand manner so I would recommend this book to astrobiologically-inclined academics and amateurs alike. The book reviews numerous potential habitats in the solar system and relates these to the potential of finding life on similar exoplanets. With a chapter on the characteristics of life on Earth this book caters for those without an in-depth knowledge of life on Earth and therefore the concepts presented in this book can be understood by those that have not had a broad education in natural sciences. This book occasionally veers away from the stereotypical watery environments, such as those of the subsurface of Mars or the subsurface oceans of Europa, to delve into the possibilities of life in such environments as the hydrocarbon lakes on Titan and the thick atmospheres of Saturn or Venus. Concerning Titan, a particular point raised in this book is the differences between Titan and the Earth. So if life on Titan were to be discovered then the lesson would be that life can be very different from us rather than gaining insight into the origins of life on Earth. I think this is an important point which is lost in many papers that purse Titan’s secrets; too often research compares Titan to primordial habitats on Earth but the composition, characteristics (e.g. temperature) and history of Titan are so unlike that of Earth that comparing Titan to the primordial chemistries and subsequent evolution of life on Earth is somewhat unfounded. The complex carbon chemistry on Titan is interesting planetary research in its own right without the need to link it to the origin of life on Earth. The authors also explore theories into the evolution and universal occurrence of intelligent life, leading into considerations of the eventual fate of intelligent life and also other types of organisms. This is a well-rounded book that considers the history and future of life on Earth, the solar system and elsewhere in the Universe.